How to Get Over Her in 1 Month by Tadhg O'Flaherty is an ideal book for all those who have suffered a breakup and still not gotten over it properly. The 31-day program will guide readers to get over their ex-girlfriend or even get her back. The visualization techniques will help readers to go into their imaginations, where they can see their future dreams unfolding before them vividly. The subconscious mind will work on the visualization becoming a reality. Whatever the reason for your girlfriend leaving you, reading this book will help to overcome that setback in your life. 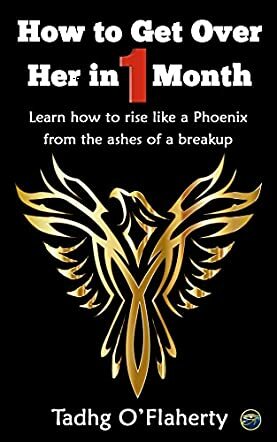 I found the book an engaging and entertaining read that will help readers to take a deeper look at what went wrong in their relationship. The tips and suggestions are simple and easy, and can be practiced without much difficulty. The personal experiences shared by the author also help readers connect well with the situation and see where they need to change to get over their past relationship. The affirmations will make readers confident and think positively when it comes to getting over their ex-girlfriend. The book will help readers become better men, yet at the same time bring them the deep love they are looking for. Reading this book will make you fearless and emerge strong, confident, and a winner.